Dan Goodman was one of the principal authors of Fairfax County's Bicycle Master Plan. During development of the plan Dan put in long hours holding advisory group meetings, conducting many, many public meetings, and working closely with FABB to gather info for developing out Bicycle Master Plan. At that time Dan worked for Toole Design Group. We were pleased to see that in September Dan was honored by the Association of Pedestrian and Bicycle Professionals (APBP) as 2017 Professional of the Year for his work in his current position as Transportation Specialist in the FHWA's Office of Human Environment. Congratulations Dan! Dan Goodman, Transportation Specialist in the Office of Human Environment (HEPH) received the Association of Pedestrian & Bicycle Professionals (APBP) 2016 Professional of the Year – Public Sector Award, during the Pro Walk/Pro Bike/Pro Place Conference held in Vancouver, Canada in September. On November 14 Adam Lind, the county bike coordinator, gave a presentation on a proposal to modify the lane striping on roads in Reston that will be repaved in 2017. The county is accepting comments on the proposal until December 2. We support the county's efforts to make Reston a better place to bike, especially the proposal for a road diet on Colts Neck Road where at least two people have been killed trying to cross the road. One option is to reduce the travel lanes from 4 to 2 with bike lanes, making the road safer for everyone. The presentation from the Nov. 14 meeting is online. This is a notice that the bike room WILL BE CLOSED FROM DECEMBER 5TH-DECEMBER 9TH. Sidewalk construction will be underway in front of both the free bike parking room and the bike parking member area. Please remove your bikes and anything else you need prior to Monday morning as there will be no access for multiple days once construction starts. 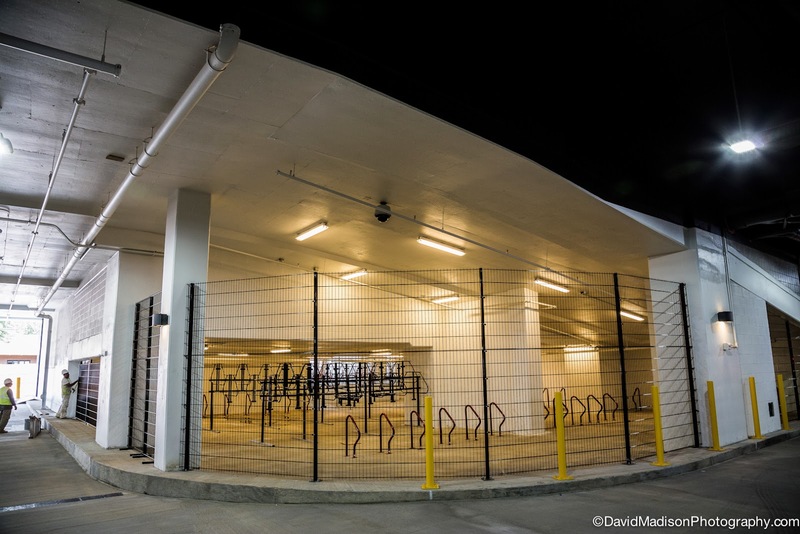 FCDOT will be providing parking options on the plaza level of the metro station next to the Bikeshare Station. Please do not park your bike anywhere else on site as the lock will be cut and it will be put into storage on G2 level (you can reclaim your bike at no cost if this happens and we will provide more info before the end of the week on who to contact). We are also in the process of hiring Two Wheel Valet to provide valet bicycle parking from 7am-9pm each day of the week that the bike room is closed. This will provide people on site to watch over your bicycles from the hours of 7am-9pm. More details to come. If you have any questions, feel free to contact me directly and we apologize for this inconvenience. An issue that will surface during this closure is the number of bike that have been left in the free bike parking area for many, many months. We occasionally mark bikes in that area to determine which bikes are left for extended periods of time, and we estimate that as many as half of the spaces are taken up by those bikes, leaving much less parking for commuters who need to use the parking on a regular basis. 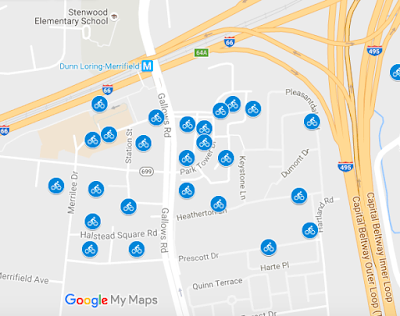 There is always the option to pay for access to the secure bike room ($75/year), but the county needs to address the issue of bike storage in the free parking area. The Alexandria Bicycle and Pedestrian Advisory Committee (BPAC) has been an advocate for increased enforcement of traffic laws city-wide, and for education/announcements of enforcement efforts as part of the five “E’s” that are important to traffic safety. (The others are Engineering, Encouragement and Evaluation). We are pleased to inform you that that both City staff and the Alexandria Police Department are increasing efforts in the areas of Education and Enforcement. We are also pleased that no single travel mode is being targeted for enforcement; recent discussions and enforcement results indicate that Alexandria Police Department enforcement is aimed at ALL roadway users. Please share our request for all Alexandria residents and visitors to respect each other, and promote safer traffic behavior throughout the City of Alexandria. 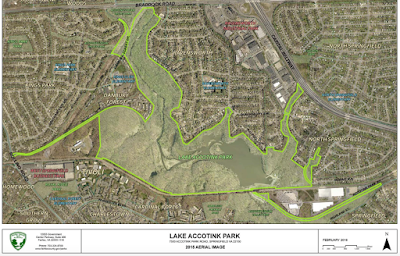 Fairfax County Park Authority will be hosting a workshop meeting on December 5, 2016 to discuss trails in Lake Accotink Park as part of the revision to the Lake Accotink Park Master Plan: how people use them, and what would improve their experience. The Cross County Trail passes through the park. In continuation of the Park Authority's effort to understand the desires of the community regarding Lake Accotink Park, we will host a community workshop specifically intended to focus on trails within the park. Join us on December 5, 2016 at Crestwood Elementary School, 6010 Hanover Avenue in Springfield from 7:00 – 8:30 to help us better understand how you use the trails, what works well for you, and ways to improve the experience. We look forward to hearing your opinion! We recently received data on locations of bike thefts in Fairfax Co between 2014-2016. Using Google Maps we've mapped those locations. There were nearly 1,000 thefts over the almost three year period, averaging about 1 bike theft every day. We wanted to know if there appeared to be a geographic pattern to the thefts. There are obvious clusters in the more developed parts of the county such as Reston, Chantilly, Burke, Springfield, Baileys Crossroads, and the Route 1 corridor. Several thefts occurred around the Dunn Loring Metro Station. I guess the take home message is that it's always a good idea to secure your bike with a good lock. Obtaining the data was not easy. We initially asked police for the data. It exists in the Daily Blotter and so it seemed like a straightforward request. We were told that the data existed in a database, but "to narrow down the search of just bicycle thefts will require a FOIA request." We made the request, paid around $25, and received the data in a pdf document that we converted to a spreadsheet. We then imported the data into Google Maps. 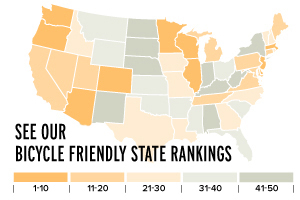 The League of American Bicyclists (LAB) has released its report card and rankings of states as being bicycling friendly, and Virginia came in as #13 nationally and #1 in the southern region. Virginia scored better during the past year in the areas of education, encouragement, infrastructure, and funding. It also scores well in policies and programs but suffered a lower score for legislation and enforcement. Update laws that discourage road diets and bicycle lanes in urban areas. Dedicate state funding for bicycle projects and programs, especially those focused on safety, eliminating gaps, and increasing access for bicycle networks. Adopt a vulnerable road use law that increases penalties for a motorist who injures or kills a bicyclist or pedestrian. Add bicycle safety as an emphasis area in the state Strategic Highway Safety Plan and aggressively fund bike safety projects. Due to an overwhelming response, the deadline to participate in the NVTA’s fall survey has been extended to November 28th! Last spring, the NVTA gained insights from individuals on their transportation issues and what changes they would like to see in the future. Using this initial round of outreach and an evaluation of current and future travel patterns, the NVTA has identified a broad range of transportation needs. As part of its second wave of outreach, the NVTA launched a survey to learn how you think we should prioritize different ways of addressing these needs. Please click here to take the survey and share the link with other Northern Virginians. FABB recently had the pleasure of having a long conversation about bicycling with Jeff Lewis, a teacher from Vienna. Jeff has been using his bike for transportation to and from work for several years. He told us that he enjoys being outside, getting exercise every day, and helping the environment. He likes to serve as an example to his students for using bicycles for transportation and recreation, believing that young people respond more to the actions rather than the words of adults. He also said that after one of his cars “died” last year, he was so comfortable with his bike commuting that he decided not to get another one. He mentioned that having one car payment instead of two really makes a difference in the family budget. Jeff rides every morning with his 9-year-old daughter to Wolftrap Elementary before continuing on to Oakton High School where he teaches Spanish. At other times he bikes with both of his daughters to get ice cream in town, pick up a few items at the grocery store, or just to ride on the W&OD Trail. He is pleased to see that his daughters seem to feel the same sense of independence and adventure when biking that he felt as a kid. When asked what he would like to change to make it easier and safer for him to ride, Jeff replied that more dedicated bike lanes would make a big difference. “Biking is so much safer and more enjoyable when you can be confident you aren't going to get run over,” he said. He added that there should be better driver's education about the rights of cyclists as well as how and when to pass a cyclist. The Town of Vienna recently was designated a Bronze Bicycle Friendly Community by the League of American Bicyclists. Congratulations Vienna! Along with Reston, they are the second bicycle friendly community in Fairfax. The town has a supportive Mayor and Town Council and they have made significant progress in the past several years improving conditions for cyclists. They have bicycle parking guidelines, several designated bike routes, a history of encouraging kids to walk and bike to school, two locally owned bike shops, and an active bicycle advisory committee. The main bicycle asset in the town is the W&OD Trail. Hundreds of cyclists pass through the town daily. Develop a design manual that meets current NACTO standards or adopt the NACTO Urban Bikeway Design Guide. This will make it easier for city staff to propose and implement bicycle facility designs that have been shown to improve conditions for people who bike in other cities throughout the United States. 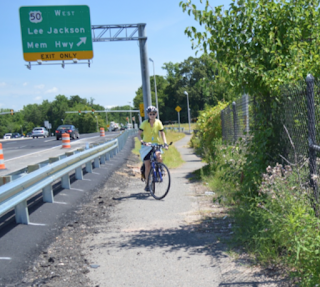 Develop more high quality bicycle facilities like the W&OD trail. The W&OD trail is a great asset for the Town of Vienna and should be a centerpiece of bicycle-related improvements that help people access commercial corridors such as Maple Avenue and provide a safe and comfortable environment for people walking and biking. Ensure that the W&OD trail does not become congested or unsafe as it serves more people who walk and bike, perhaps by separating people biking and walking. Consider ways to promote more trail-facing businesses. Bicycle-safety education should be a routine part of education, for students of all ages, and schools and the surrounding neighborhoods should be particularly safe and convenient for biking and walking. Work with local bicycle groups and interested parents to expand and improve the Safe Routes to School program to all schools. Work to create a low-stress network that utilizes existing low-speed streets. Wayfinding improvements that guide people along bicycle routes and identifies the distance and time to destinations can be helpful for navigating bicycle routes. Pursue a Transportation Demand Management program, perhaps as part of other region-wide programs, to help employees and employers find ways to walk and bike more while using single occupant cars less. Just a quick reminder that FABB’s monthly meeting is tomorrow night, Wednesday, 16 November, at the McLean Governmental Center at 1437 Balls Hill Road in McLean. The meeting starts at 7:30 pm. We’re honored to be welcoming Dranesville District Supervisor Foust and Fairfax County Bicycle Coordinator Adam Lind to discuss bicycling in the McLean-Tysons-Falls Church area. See you there! If you live in West Springfield/Burke near Shiplett Boulevard, Burke, Burke Lake or Coffer Woods Roads, you may have noticed the construction in the Pohick Stream Valley behind the Burke Post Office and Burke Nursery. This is the long awaited Liberty Bell Trail. It will allow pedestrian and bike connections between Shiplett Boulevard at Hatches Court (near White Oaks Elementary), Burke Road at the 90-degree bend called fondly by many "Dead Man's Curve,” and Burke Lake Road at the Coffer Woods Signal. 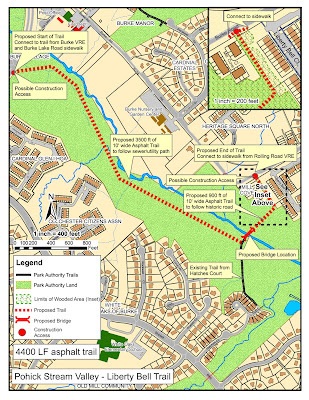 The trail is a joint VDOT and Fairfax County Parks project designed to connect neighborhoods in the Pohick Valley Stream Park area to the Burke Road bike lanes leading to the Rolling Road VRE station. It also connects to the Burke VRE Station via the Burke VRE trail and to businesses along Roberts Road and Burke Lake Road, including the Burke Post Office. 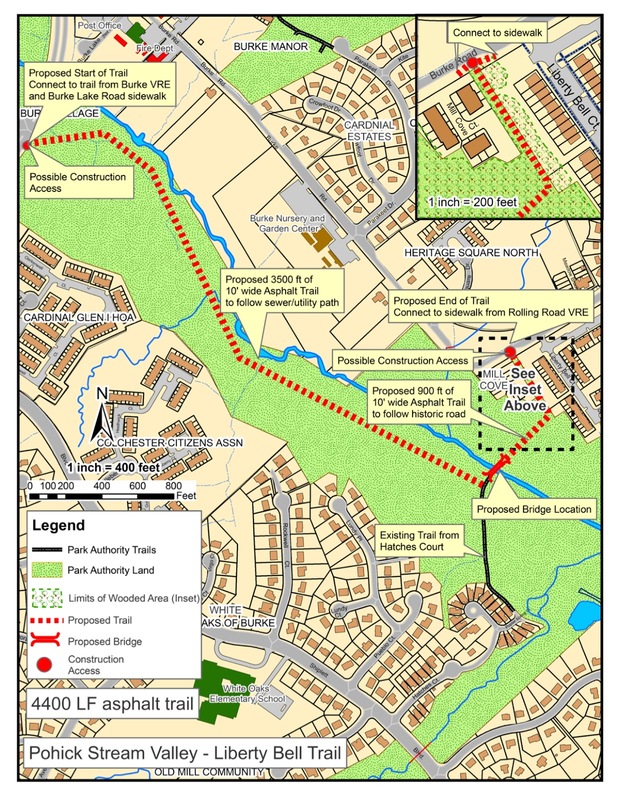 This new bicycle and pedestrian facility will provide local residents and visitors with much needed recreational and nature access to the Pohick Stream Valley. By extending the trail network to the Burke VRE station, the farmers market there will just be a short and fun Saturday morning run/ride away! Watch this blog for more information about the scheduling of and participation in the opening celebration. As we noted earlier, FCDOT is holding a public meeting on Monday, November 14 to gather input on various proposals to improve traffic safety, bicycling, and the pedestrian environment in Reston. Please consider attending this meeting and supporting the county's efforts to make biking safer and more convenient in Reston. Fairfax County Department of Transportation (FCDOT) will host a community meeting to discuss proposed bike lanes in the Hunter Mill District on Monday, November 14, 2016, 6:30 to 8:30 p.m., in the cafeteria of Terraset Elementary School, 11411 Ridge Heights Road, Reston. The purpose of the meeting is to gather input on various proposals to improve traffic safety, bicycling and the pedestrian environment in Reston. FCDOT and VDOT are holding three community meetings this month to discuss the Fairfax County Parkway and Franconia-Springfield Parkway. The DOT’s have been evaluating existing transportation issues and are developing recommendations for short-term multimodal improvements that can be implemented within the next one to ten years. The meetings will be held next Monday, November 14, in Herndon, next Wednesday, November 16, in Burke, and on Monday, November 21, in Alexandria. The meetings all begin at 7 p.m. Please visit this link for information and specific meeting locations. It would be great if some FABB members could attend each of the meetings (and, yes, we know that our Dranesville District meeting is scheduled for next Wednesday). But, we need to spread out and advocate. In particular, we need someone to attend to reemphasize that on Fairfax Co Parkway there are especially dangerous ramp crossings at Spring Street, the Dulles Toll Road, and Route 50. In addition, the unsigned detours need to be signed and the detours and trail in general need to be improved. Members also can provide comments until close of business on Wednesday, December 7, 2016, by e-mail: meetingcomments@vdot.virginia.gov or mail: Mr. Abraham Lerner, P.E., Virginia Department of Transportation, 4975 Alliance Drive, Fairfax, VA 22030. Please reference "Fairfax County Parkway & Franconia-Springfield Parkway Corridor Study" in the subject line. Please plan on joining FABB for our November meeting, which will be held at the McLean Governmental Center next Wednesday, November 16, from 7:30 to 9:00 pm. We will be welcoming Dranesville District Supervisor John Foust for a discussion of bicycling and related transportation developments in the areas around McLean, Tysons, and Falls Church. Adam Lind, the Fairfax County Department of Transportation Bicycle Coordinator, also will be there to talk about current and future bicycling projects in the southern part of the district. And, of course, the meeting will provide an opportunity for riders and other to raise questions and share their ideas about bicycling in the southern part of Dranesville District. We are hoping to have a great turnout, so please help spread the word about this upcoming meeting.